The Irish College, Rome was founded on January 1st 1628 by the Irish Franciscan, Fr Luke Wadding O.F.M. and the Italian Cardinal, Ludivico Ludovisi, a nephew of Pope Gregory XV, who died three years before the College was established. Having been appointed Cardinal Protector of Ireland, Ludovisi was concerned that his title would not be an empty one and when he was approached by Luke Wadding to help educate Irish priests in Rome, he readily undertook the task of founding the Irish College. The College was under the care of the Franciscans at the beginning. An Irish priest, Fr Eugene Callanan, became the first Rector of the College. When he died in July 1629, the Franciscans became Rectors of the College until a dispute with the Jesuits for care of the College was decided at the Sacred Roman Rota in 1635. From then onwards, until the visitation of Cardinal Marafoschi in 1772, the Irish College was run by the Jesuits and by Irish secular priests. 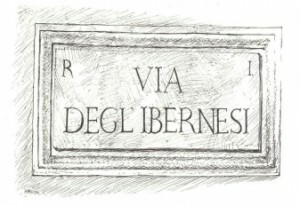 It was situated in the street which to this day is known as Via degli Ibernesi. Many manuscripts from this era of the history of the College are preserved in the College Archive. Among the most important of these is a manuscript history of the College written in 1678 by the Jesuit priest, Father James O’Reilly. The artistic and historic patrimony of the College was collected, for the greater part, during these years also. Among the most notable seminarians educated during this period of the College were St Oliver Plunkett, the martyred Archbishop of Armagh, his close friend Archbishop James Brennan of Cashel and many other famous bishops and priests of the seventeenth and eighteenth centuries. The anti-Jesuit campaign of the mid-eighteenth century was felt in the Irish College also. Some student unrest led to the visitation of Cardinal Marefoschi and the subsequent placement of the College under the care of an Italian secular priest, Fr Luigi Cuccagni. Despite many efforts to have an Irish Rector installed in the College, Cuccagni served his rectorate until the French entered Rome in June 1798. The College was closed for twenty eight years during the French Invasion and the Napoleonic Wars. Once they were over, however, the need to re-open the College was felt and in October 1826 the first students of the restored College arrived in Rome. Having lost the property in Via degli Ibernesi to some Sisters, Pope Leo XII granted the Umbrian College to Father Michael Blake, a priest of the Archdiocese of Dublin, who came to Rome for the purpose of trying to re-establish the College. Within six years the two of the most famous Rectors of the College entered the pages of its history. Paul Cullen served as Rector for seventeen years, before going to Armagh as Archbishop and subsequently to Dublin as Archbishop and eventually as Ireland’s first Cardinal. He was succeeded by Tobias Kirby, a priest of the Diocese of Waterford and Lismore, who served as Rector for forty-one years from 1850 until he retired in 1891. The College archive contains his entire collection of letters, one of the most important private collections for the history of the nineteenth century in the English speaking world. This material may be accessed through the archive section of this website. The early twentieth century saw the College under the care of two Rectors known for their nationalistic fervour, Michael O`Riordan from Limerick and John Hagan from Dublin. In 1926 Hagan decided to leave the site of the old College at the Church of St Agata dei Goti and move to its present site on the Via dei S.S. Quattro. To view a news report from the RTÉ archives of the visit of Pope Saint John Paul to the Irish College in 1980, click here. After almost four hundred years, the Irish College continues to fulfil the purpose for which it was founded, the education of students for the priesthood in Ireland. Today it also accommodates Irish priests who are doing postgraduate studies in Rome, as well as postgraduate priests from other parts of the world. In particular, in recent years, students from the Orthodox Churches have studied at the College under the auspices of the Pontifical Council for Christian Unity. When Pope Leo XII re-opened the College in 1826 he remarked that the College had a two-fold purpose, the education of students in Rome and the mission to Ireland. With the revolution in modern means of travel, the second part of the mission of the College is fulfilled nowadays by providing accommodation for pilgrims to Rome, especially during the summer months when the seminarians and priests are away from Rome. 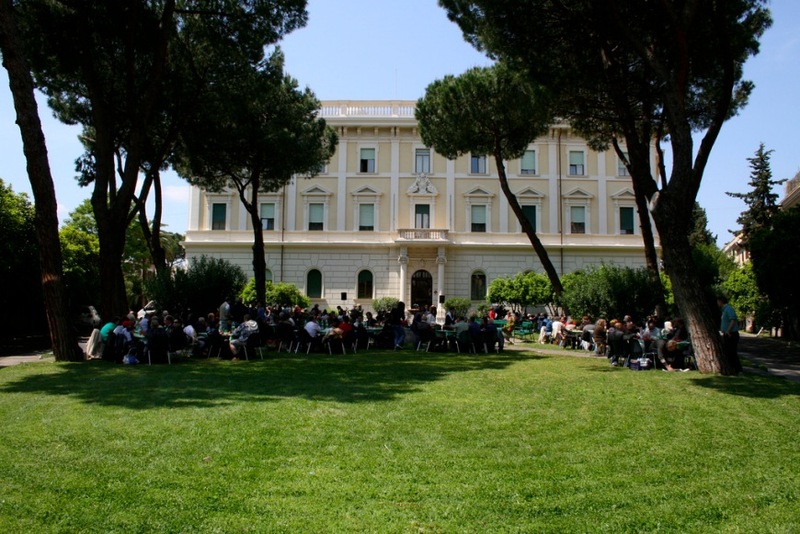 The College becomes a Pilgrim Centre during the months of July, August and September, a place where people can come to find rest, visit the historic sites of Rome, attend the many liturgical functions provided by the College and also benefit from the direction which is provided for them. For further reading see Daire Keogh & Albert McDonnell (Eds) The Irish College, Rome and its World (Dublin, 2008).